Car Pool Detail is Richmond’s most advanced high-end automotive detailing establishment. The professional staff has served the Richmond metro, Washington, D.C., and Mid Atlantic Region since 1979, specializing in enhanced automotive cleaning, detailing, and restoration services. Far exceeding customer expectations, Car Pool Detail delivers incomparable quality and customer service. 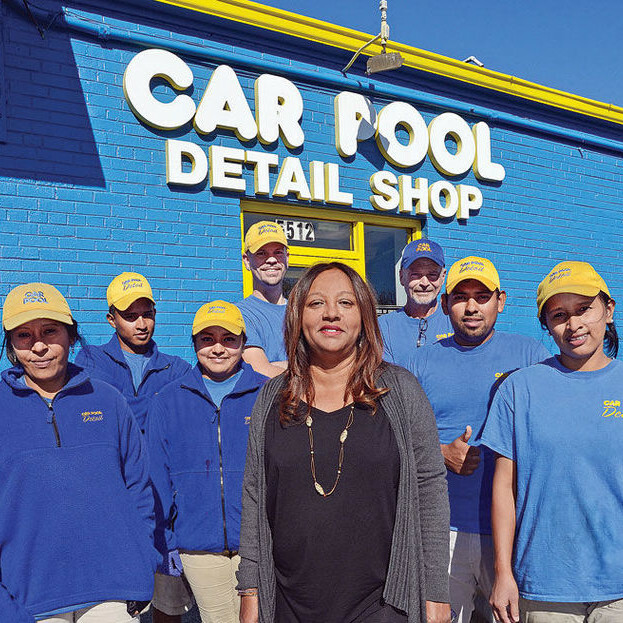 Car Pool Detail has won several awards including Best Car Detailing in Richmond Magazine in 2004, 2009, and 2010, Angie’s List Super Service Award ® 2008, and Best customer Service in 2007. Fully trained and informed about new detailing equipment, products, and techniques to increase results for their customers, managing partner Gina Budhai, leads a team of certified detailing professionals who treat automotive detailing like a science. Although Gina admits many people think they can maintain their own automobile, she takes her work very seriously. Professional detailing is much different from washing and cleaning your car at home, no matter how meticulous you are. You want to use someone who understands paint when buffing and polishing a car, or serious damage can be done. Car Pool Detail uses products the customer knows, that are easy to use, and proven by research and testing to be effective and safe like Meguiars™, Auto Magic™, 3M™, Wolfgang™, Ardex™, Optimum™, Zaino™, P21S™ and Pinnacle™ for waxing. Car Pool Detail detailers hold certifications for smoke and odor removal, mold and mildew clean up, paintless dent repair (PDR), scratch removal, and interior and exterior repair. When you leave your car with Car Pool Detail, you are leaving your car in very capable hands! Reputation -Known among auto dealerships, insurance companies, fleet companies, auto mechanics, automotive body shops, auto upholstery shops, and many of your friends and neighbors, as the most experienced auto detailing service provider in the greater Richmond area! Experience – For over 30 years, Car Pool Detail has been cleaning and restoring vehicles to showroom floor status. Our staff has years of professional training, and over 50 years combined hands-on experience, resulting in over 25 Concours d’ Elegance Awards for clients. You will be amazed at the results! Education – Certified by The Clean Trust (formerly the IICRC), the world’s most recognized body of certification for carpet and upholstery cleaners, we also carry certification by some of the industry’s leading professionals and product lines, including IDA Meguiar’s™, Water Doctors™, Glass Weld™, SEM™, Bridgepoint Industries™, and Dupont™. Cutting-edge Cleaning Systems – Car Pool Detail uses CFR™ cleaning systems, which are the most advanced on the market. These systems provide maximum soil and spot removal without leaving a sticky residue or saturating your carpet. Vapor Steam machines sanitize and kill bacteria; Ozone machines help in the removal of odors; In-Car Air Quality Machines sanitize and kill micro-organisms such as mold, throughout the ventilation system and passenger cabin surfaces of your automobile. Guarantee – Car Pool Detail offers a 100% money-back guarantee. If you’re not completely satisfied, we will either re-detail your vehicle for free or refund your money! Award-Winning – We have been voted Richmond’s Best Auto Detailing Service by Richmond Magazine in 2004, 2009 and 2010; voted Best Customer Service by the Richmond Times Dispatch in 2006; voted Best Detailer in 2006 by Professional Carwash and Detail Magazine; featured in Who is Who in Car Care; and won Angie’s List Super Service Award. Insured – Car Pool Detail carries full insurance for your protection and ours! Convenience: We are conveniently located in the Willow Lawn area with easy access from Interstate 64. We are a one-stop shop, offering a variety of detailing and small repair services for your automobile. You can both shop and eat at restaurants and stores, all within walking distance, while your car is being detailed. If you prefer to wait, we provide wi-fi and coffee in our comfortable, spacious waiting area. Recognition – Managing Partner, Gina Budhai is an award-winning expert in the detailing field, having written articles for the VA Women’s Magazine and Professional Car Wash and Detailing Magazine, who dubbed her “Queen of Detailing” in their 2007 issue. Professional Trade Associations – Gina is a Certified and Skill Validated member of the IDA (International Detail Association) IICRC Certified , a member of National Association for Professional Women (NAPW), sits on the Advisory Board for the Richmond Technical Center and National Ozone Association. CAR POOL DETAIL. FOR THE LONG LIFE OF YOUR VEHICLE! Car Pool Detail has solutions to help you defy your car’s age. Slow down the declining value of your car with Car Pool Detail’s Anti-Aging technology and rejuvenating car care.